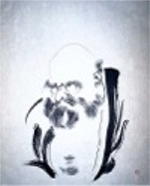 Bub Ihn (Adrian Contee) asked Sunim;"Sunim, my friend asked me how he can become a Zen Master. How should I answer him?" Sunim said, "Tell him to make a business card." A member of the Phoenix Sangha asked, "Sunim, you are a great, great Master and I respect you with all of my heart." Sunim said, "Come down from there." In the airplane, traveling from Phoenix to Los Angeles, Sunim pointed with his finger to smoke on the Earth outside the window and said to the Grand Master Mo-Fung, "Baking coals in the Southern Mountain!" The Master replied immediately, "Scattering ashes in the Northern Mountain!" Sunim bowed to his Master. The Master patted Sunim on the shoulder. At the Phoenix Zen Sangha, Sunim was coming from outside, when the Grand Master Mo-Fung asked, "Originally there is no coming nor going, where are you coming from?" Sunim replied, "I am coming from where there is originally no coming nor going." Sunim asked, "Buddha-nature has no mouth. By what means do you talk?" Then answered himself, "Where there is no mountain, Sages climb the summit everyday." And said, "Let's have a cup of tea." Dae-Oh (Jason Bullock) asked Sunim, " What Zen books do you recommend for real Zen practice?" Sunim answered, "Page by page, meaning is very clear." A visitor asked Sunim, "I heard that Zen Masters beat their students. Do you beat people too?" Sunim said, "I am not beating a corpse." An elder member, Ken, said, "Sunim is my son." Sunim replied, "That's right. Because I gave birth to you." 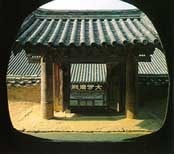 Korean Monk Mok-Woo visited the Sangha and said, "Sunim, you speak about Zen; but when you say Zen, it is not Zen already." Sunim said, "What is it then?" Mok-Woo replied after a while, "I don't know." Sunim said, "You have two nostrils on your face." Bruce, a Sangha member, now based in Iraq asked, "Sunim, I remember that you once said, 'When Spring comes, grass grows naturally'. But what about in the desert, where there’s no grass, rain, or fun?" Sunim replied, "Hair grows on front teeth." 9:00 p.m. EST (New York Time). Now on gotomeeting.com. Back to its original 9:00 p.m. time: Join Sunim's live video Dharma talk. No longer on Skype! Now on gotomeeting.com. All are welcome. Click here for details. At the end of your work week, decompress with an extended meditation session. Arrive by 9 p.m. to get a one-on-one koan interview with Zen Master Pohwa Sunim. Click here for more information. DVDS AVAILABLE!!! Five DVDs of the Zen Dharma Exchange are now available at Amazon.com. ©2006 World Zen Fellowship. All Rights Reserved.